A box is a container used to put things in. It is mainly a cuboid (square) shape, but it can be other shapes too. Boxes are usually made out of cardboard, wood, plastic or metal. Many boxes are made of cardboard, and a lot of them are made. They are primarily used for packaging commercial goods or storing goods and materials. They can be made from bent or wrinkled cardboard. In their most obvious life stage they are popularly used as a cheap material to hold a range of projects, among them being science experiments, children's toys, costumes and other things. A box also means a rectangle, e.g. userbox. But rectangles are mainly referred to as rectangles, the term box is the outline, or perimeter of the rectangle. Several types of boxes are used in packaging and storage. A corrugated box is a shipping container made of corrugated fiberboard. These are most commonly used to transport and warehouse products during distribution, and are rated according to the strength of the material or the capacity of the finished box. A folding carton (sometimes called a box) is fabricated from paperboard. The paperboard is printed (if necessary), die-cut and scored to form a blank. These are transported and stored flat, and erected at the point of filling. These are used to package a wide range of goods, intended either for one-time (non-resealable) use or as a storage box for the remaining goods. 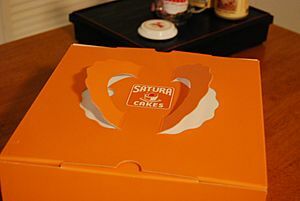 A type of the folding carton is the gift box, used for birthday or Christmas gifts and often wrapped in decorative wrapping paper; this type is usually of much lighter construction than a similar-sized paperboard box meant for packaging and distribution. 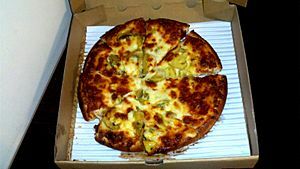 A "set up" box (or rigid paperboard box) is made of stiffer paperboard, permanently glued together with paper skins that can be printed or colored. Unlike folding cartons, these are assembled at the point of manufacture and transported already "set-up". Set-up boxes are more expensive than folding boxes and are typically used for protecting high value items such as cosmetics, watches or smaller consumer electronics. A crate is a heavy duty shipping container originally made of wood. Crates are distinct from wooden boxes, also used as heavy duty shipping containers. For a wooden container to be a crate, all six of its sides must be put in place to result in the rated strength of the container. The strength of a wooden box, on the other hand, is rated based on the weight it can carry before the top or opening is installed. A variant of the wooden box is the wooden wine box or wine crate, originally used for shipping and storing expensive wines,but nowadays for decorative or promotional purposes or as a storage box instead of for protection during shipping. A bulk box is a large box often used in industrial environments. It is sized to fit well on a pallet. Depending on locale and specific usage, the terms carton and box are sometimes used interchangeably. The invention of large steel intermodal shipping containers has helped advance the globalization of commerce. Boxes for storing various items in can often be very decorative, as they are intended for permanent use and sometimes are put on display in certain locations. 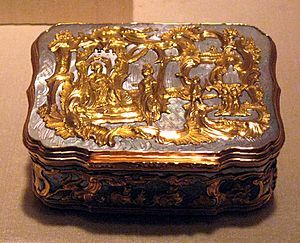 A jewelry (AmE) or jewellery (BrE) box, is a box for trinkets or jewels. It can take a very modest form with paper covering and lining, covered in leather and lined with satin, or be larger and more highly decorated. A humidor is a special box for storing cigars at the proper humidity, by means of absorbent materials that retain and moderate moisture coming from the cigars. Powered boxes can also maintain the right temperature. A "strong box" or safe, is a secure lockable box for storing money or other valuable items. The term "strong box" is sometimes used for safes that are no longer portable boxes but are installed in a wall or floor for increased security. A toolbox is used for carrying tools of various kinds. The term implies a container meant for portability rather than just storage, for instance with hinged lids, clasps or locks, reinforced corners, and handles. Toolboxes are usually very sturdy, but unlike a shipping box containing dunnage, are not expected to fully protect their contents if the box is inverted or upended. The common storage box for tools, instruments, glassware, artworks, etc. is a sturdy box made to be longer-lasting and better-finished than a shipping box or crate. 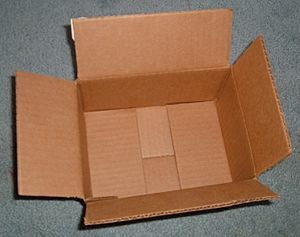 For instance, a box might be a rigid paperboard box instead of a corrugated box. Or it could be a wooden box with a sanded surface and mitered corners instead of a crude crate construction. A storage box may or may not have dunnage or cushions that protect the contents if the box is upended or shaken, and usually does not have hinges, latches or locks, but simply a cover. Boxwood gets its name from its superior properties for manufacturing this type of box, although those properties are equally useful when making a decorative box. A boxfile is used commonly in offices for storing papers and smaller files. Junction box, a fixed container for joining electrical connections, frequently installed in walls and containing electrical outlets. Letter box (in the US usually called mailbox), positioned near or on the mail recipient's home or place of work. Post office box, (often abbreviated P.O. 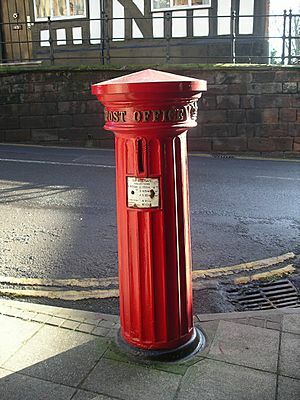 box or PO box), a box rented by the mail recipient to be an independent postal address, located in a post office or in the premises of a company offering such facilities. Self-service boxes are unlocked by the recipient, otherwise a postal clerk retrieves the mail. A relay box is similar to a post or mail box, but totally locked; post office trucks deposit mail that is then retrieved and delivered by pedestrian mail carriers. 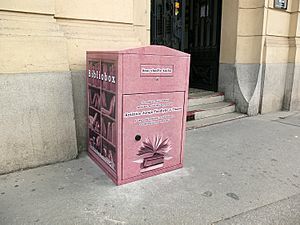 In the United States, they are painted differently from collection boxes. Penalty box, a booth used in many ball-team sports where a player sits to serve the time of a given penalty. Police box, a booth for use by police in 20th century Britain. Signal box, a building by a railway to coordinate and control railway signals. Telephone box, a booth containing a public telephone. 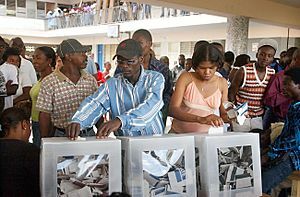 Ballot box, a box in which votes (ballot papers) are deposited during voting. Black box, something for which the internal operation is not described but its function is. Box, informal reference to large box-shaped parts of a computer, such as the base unit or tower case of a personal computer. Check box, on paper, normally to check off as opinion or option. Coach Box or the driver's seat on a carriage coach. Dispatch box, (or despatch box), a box for holding official papers and transporting them. Event data recorder, commonly called a "black box", a durable data-recording device found in some vehicles, used to assist in the investigation of an accident. First aid box is a collection of supplies and equipment for use in giving first aid to someone. Jack-in-the-box, a children's toy containing a surprise. Lunch box, or "lunch pail" or "lunch kit", a rigid container used for carrying food. Can also be decorative. Mitre box, a woodworking tool used to guide a hand saw to make precise mitre cuts in a board. Nest box, a substitute for a hole in a tree for birds to make a nest in. Pandora's box, in Greek mythology, a box containing the evils of mankind and also hope. Set-top box, a device used to decode and display TV signals. Singing bird box, an objet d'art which contains within a miniature automaton singing bird. Box Facts for Kids. Kiddle Encyclopedia.